Bright and bold, the flowers blossoming from our Spring Has Sprung Bulb Basket are truly unforgettable! 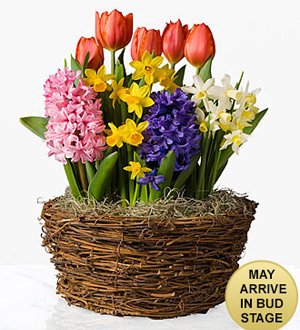 Planted in a dark brown natural basket, this collection of bulbs includes tulips, daffodils, and hyacinth blooms. Set to bloom up to 4-6 weeks after arrival, this colorful collection of bulb flowers will bring fun and sweet beauty to their spring celebrations, making it the perfect Easter, Mother's Day, or birthday gift.